ASTRO-VISION astrological calculations are based on scientific equations and not on any specific published almanac. 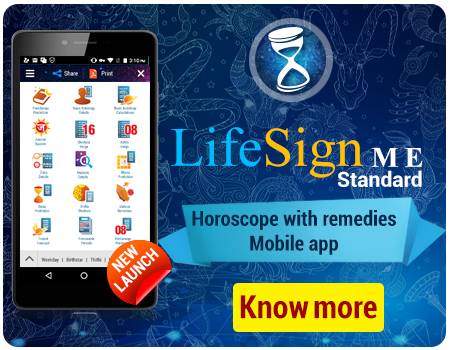 Although broadly based on Indian Predictive Astrology / Numerology, the reports generated by the software should be considered as an independent work of Astro-Vision and the predictive texts shall be considered purely as an opinion based on the principles of Astrology. Astro-Vision shall not entertain any dispute on differences arising out of such comparisons. However, Astro-Vision shall reply to any customer complaints or feedback within a reasonable time period and clarify any point based on the prediction made by Astro-Vision. While Astro-Vision shall try to ensure that the software is developed error-free, Astro-Vision does not rule out the possibility of any unexpected errors. In case of any such errors, Astro-Vision's liability is limited to the extent of replacing the software with a rectified one. Cancellation of orders may be considered only in case of purchases made by the customers by mistake. However, the Company may at its sole discretion consider the cancellation in other cases and may refund in part or full.